This pendant comes from the Abruzzi. The Abruzzi is a remote and mountainous area of central Italy, and traditional jewellery survived there longer than in many other parts of the country. It was formerly part of the Kingdom of the Two Sicilies, and the jewellery is often different from that found elsewhere in northern and central Italy. 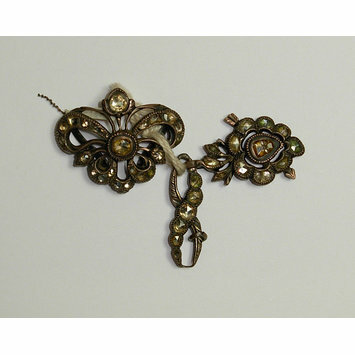 The details of this pendant are typical of work from that area, but there is nothing distinctive about the design. It was described as a bridal gift, and the motif, of a flaming heart pierced by an arrow, was common in sentimental jewellery throughout Europe in the 19th century. Its original owner would have worn it on a ribbon, strung through the two diagonal loops on the back of the top part, and tied at the back of her neck. 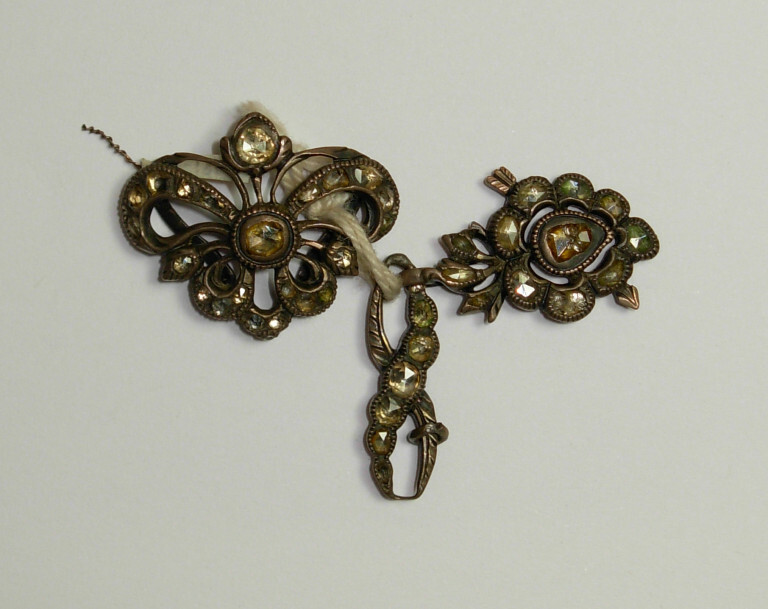 It was bought as part of the Castellani collection of Italian Peasant Jewellery at the International Exhibition, Paris, 1867. Three-part pendant of cast openwork silver set with rose cut diamonds. The top part is shaped like a stylised bow. The bottom part is shaped like a heart, pierced by an arrow. The top part has two diagonal bars on the back, for suspension. Silver pierced heart pendant set with diamonds, Abruzzi (Italy), 1800-1867.